Teacher and I have been following the Love and Logic approach to parenting – with varying degrees of dedication and success – for several years now. One of the recommendations is to have children be responsible for a family meal once a week, beginning around age 8. We’d followed that suggestion for a while, but Teacher really likes to cook and missed it, so we let it slide for a while. But recently Teacher has started rehearsing another production with Kimberly Papermaker Players and has less time for everything else he has to do, so we decided to have the boys start helping out with dinners again. 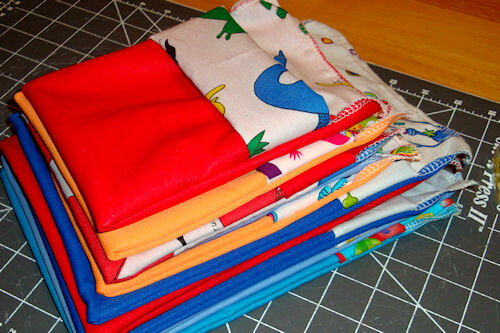 The first thing Z-Man and Little Guy wanted to make were Hot Dog Squids. 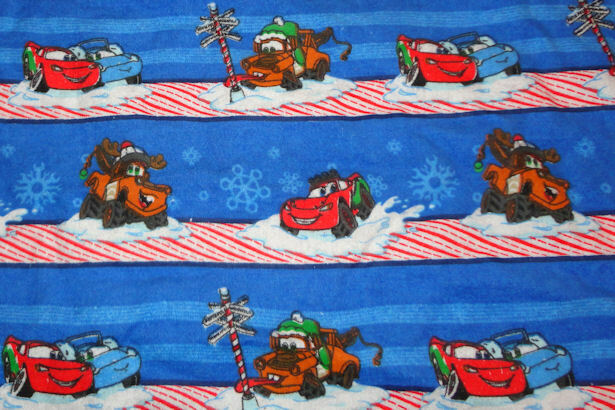 They’d made them at a Boy Pioneers meeting and were obsessed. Neither Teacher or I had any interest in having Hot Dog Squids so we planned them for a Friday night when we’d be gone on Date Night. 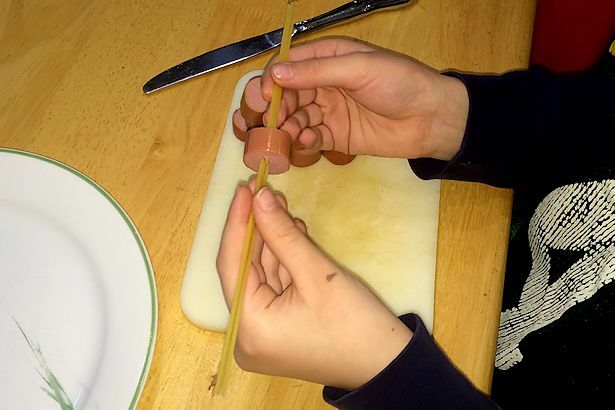 Hot Dog Squids are super easy to make – the hardest part is putting them into the boiling water and getting them back out again! 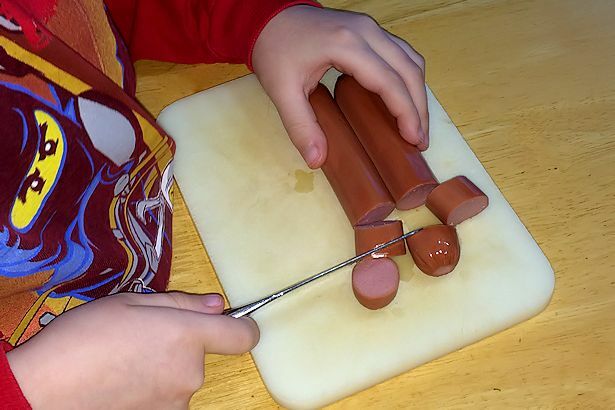 First you need to cut the hot dogs into about 1″ pieces. 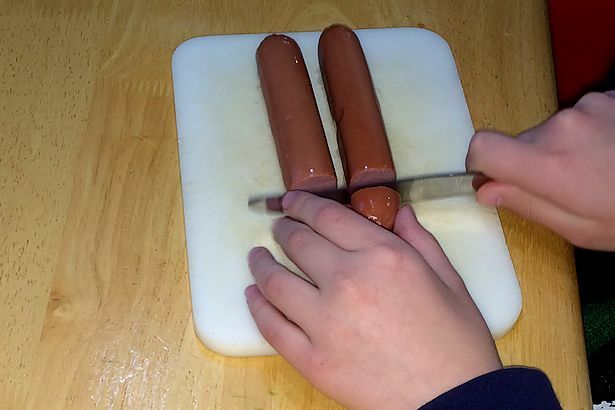 Hot dogs are so soft that they can be cut with butter or plastic knives. We used nitrate free turkey dogs, but you can use whatever type you like best. Except maybe cheese dogs – I don’t think that would end well. 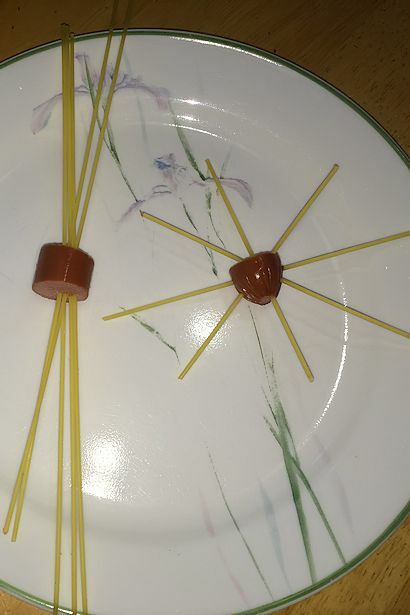 Next you stick several pieces of spaghetti through the hot dogs. Z-Man says that you’re OK with up to 8-10 pieces but more than that explode the hot dog. 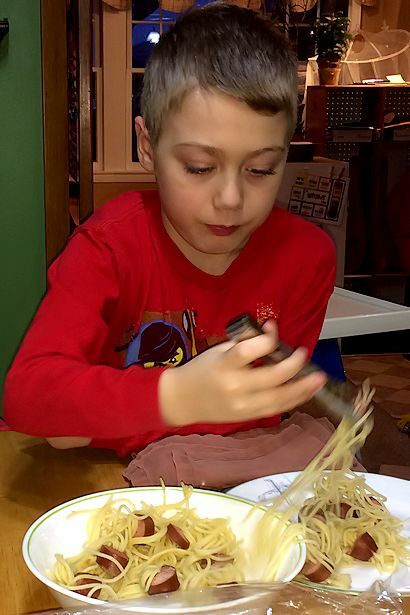 We used organic thin spaghetti; if you use regular spaghetti you may want to put fewer pieces in. Little Guy took it to another level and let his artistic side show. Two distinctly different styles but both get the job done. It’s a little time-consuming, especially if you do it Little Guy’s way, but by the time the water is boiling you should be done. 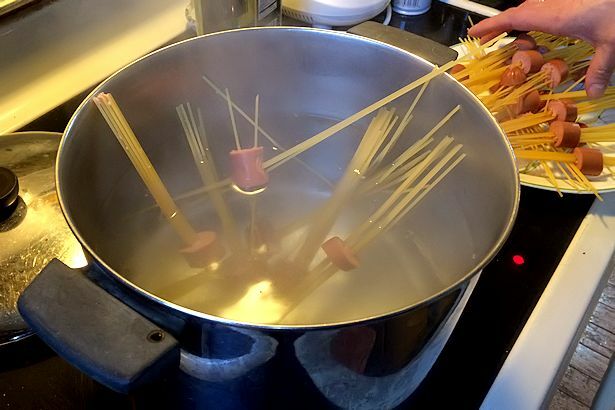 Carefully place the hot dog squids into boiling water and cook according to the directions on the spaghetti package. When the hot dog squids are done, drain and place into a bowl. 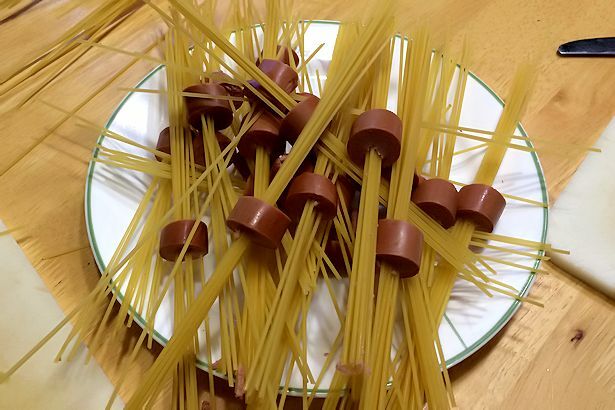 You could add butter or olive oil so the spaghetti doesn’t stick together. 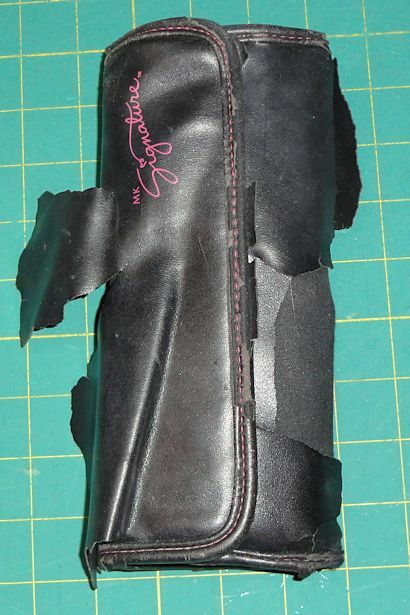 Whoops, we’ve got an exploded one right on top. Squid down! Squid down! Our boys liked them just plain, but you could serve them with ketchup, spaghetti sauce, or swimming in tomato soup if you like. Hot dog squids in front of Phineas and Ferb – can life get any better for a nine-year-old? 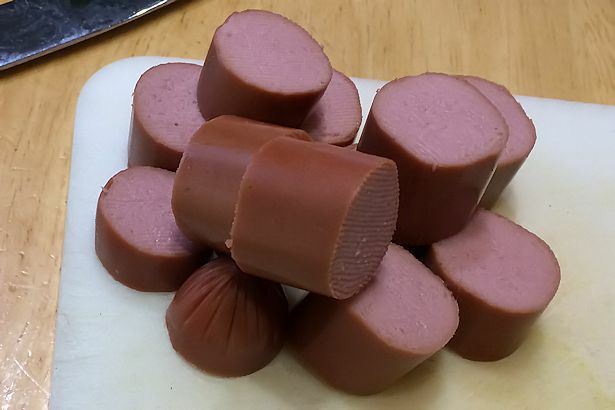 Hot dog squids are so easy to make that I feel kind of silly typing out an official recipe, but I know some people like to have actual recipes. Fill a large pot with water. Add some salt, then put the pot on the stove to boil. Cut the hot dogs into piece about 1″ long. 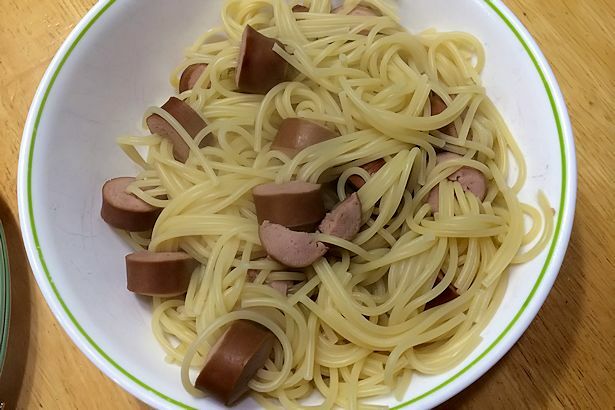 Push several pieces of uncooked spaghetti through a hot dog segment from one cut side to the other. There should be about equal amounts of spaghetti sticking out each side of the hot dog. 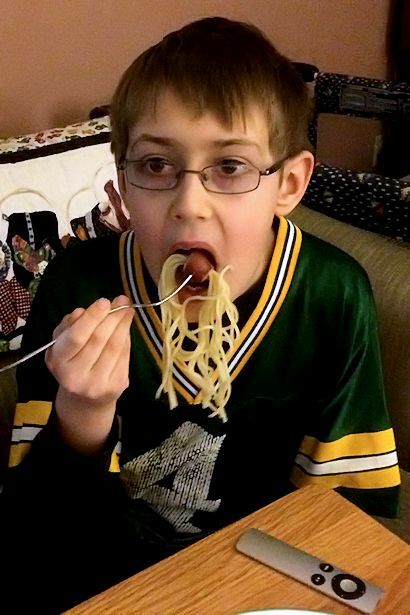 Repeat until all of the hot dog segments have spaghetti in them. When the water is boiling place the hot dog squids into the water carefully so they don’t splash. Boil according to the directions on the spaghetti package. When spaghetti is done as desired, drain and serve with ketchup, spaghetti sauce, or in tomato soup. As a rule I don’t serve hot dogs in my child care, but I may make an exception and try Hot Dog Squids for a special occasion. 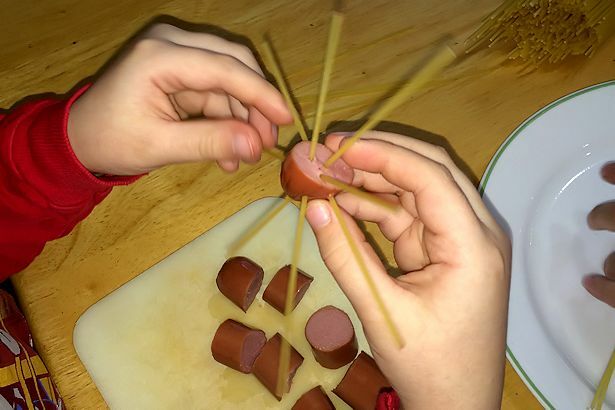 If you make Hot Dog Squids for your kids, post a comment below and let me know what they thought!